It's here! It's here! Crocktober is FINALLY here! If you're new to the blog, you'll know that every October I do something called Crocktober where I share nothing, but crockpot/instant pot recipes for the entire month! 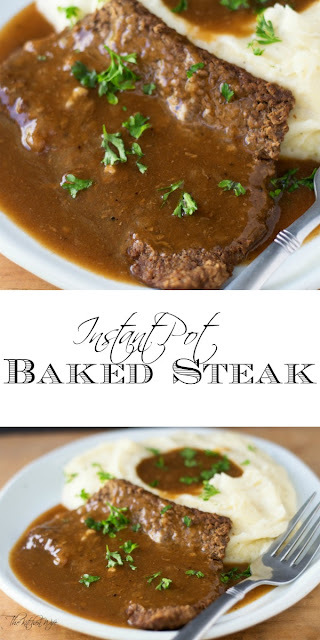 I have some DELICIOUS ones line up for you this year starting with this Instant Pot Baked Steak Recipe! To begin you will need to season the cubed steak with salt and pepper on both sides. Next, place the seasoned cubed steak into the Instant Pot insert. Place the lid onto your instant pot, making sure the valve is set to SEALING. Hit the MANUAL button and set the time for 60 minutes. When the 60 minutes has elapsed, you will do a quick release. Remove the steak from the broth. It's going to be SUPER tender, so it will fall a part a little. Once you have removed all the steak from the instant pot, turn the setting to SAUTE. Combine the cornstarch and water in a little measuring cup and pour into the broth. Let simmer until the gravy thickens, about 10 minutes. Return the meat to the gravy. 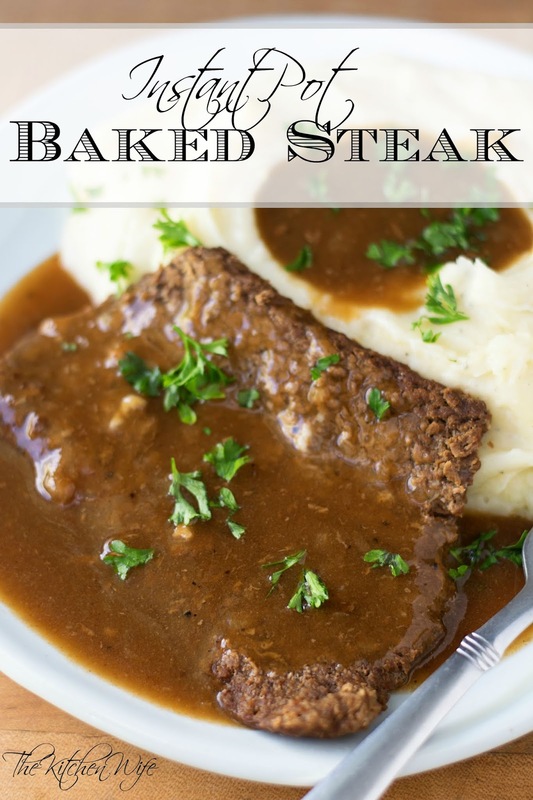 This baked steak is so tender and FULL of BIG flavor! I know that I omitted the breading and frying process, and you traditionalist may come for me, but give this a try. I GUARANTEE you won't miss it! I like to served my Instant Pot Baked Steak with some creamy mashed potatoes and green beans. In my opinion dinner just doesn't get any better than this! I know you and yours are going to love this dish so get in the kitchen and make it TONIGHT! Season the cubed steak with salt and pepper on both sides. Place the seasoned cubed steak into the instant pot insert. Sprinkle in the au jus gravy mix, minced onion, steak sauce, and beef broth. Turn the instant pot to MANUAL and set the timer to 60 minutes. After 60 minutes, do a quick release. When the pressure has released, remove the steak from the broth. Combine the cornstarch and water in a measuring cup and add to the broth. Let simmer until the gravy thickens, about 10 minutes. 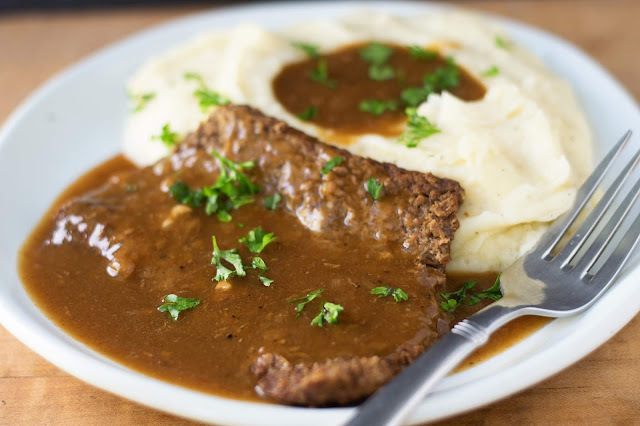 Return the steak to the gravy, Serve and Enjoy! Season the cubed steak with salt and pepper. Add the au jus gravy mix, minced onion, steak sauce, and beef broth. Cook on LOW for 6-8 hours or HIGH for 4-6. 30 minutes before serving, combine the cornstarch and water together and pour into the crockpot. Let simmer in the crockpot for 30 minutes to thicken.